As the pictures show, the cars develop into something more contemporary. For many, a "fintail" is not really a vintage car. An old car maybe. Yet these cars are more and more difficult to find, if one looks for one in an excellent condition. This page connects to books and e-books I have written about vehicles from the six-cylinder Mercedes 220 b with its new safety features to the fantastic Pagoda SL, the luxurious 600 and the equally exciting 300 SEL 6.3. Please click on one of the above pictures to read more about the car of your interest. I hope you will enjoy. The printed book that covers the cars shown in the first row, is available here for US customers and here for readers from the UK. I am now in the process to write books about selected individual cars. 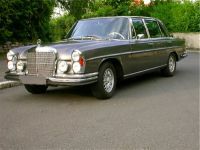 So far I have covered the two- and four-door models of the W111 and also of the W112 models. The W111 book can be found here (US) and here (UK). The W112 book can be found here (US) and here (UK). here for US and here for UK readers. Individual books have been written about the six-cylinder and eight-cylinder W108/W109 models. The six-cylinder book can be found here (US) and here (UK). The V8 book can be found here (US) and here (UK). Readers from other countries please go to your respective local Amazon site and search for "koehling" without the quotation marks. I know, it's a bit cumbersome, but many thanks for your understanding. If you find for example some price differences between books in $ or in £, this is unfortunately beyond the influence of the author, as pricing and discounts are at the discretion of Amazon.